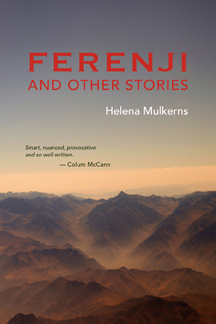 FERENJI, the debut title from Helena Mulkerns, is a themed collection of short fiction published by Doire Press. Set in the world of international workers in developing, conflict and post-conflict areas, inspiration comes partly from the author’s personal experience and research completed while working in Central America, Africa and Afghanistan. The story Dogs was shortlisted for the 2017 Bórd Gais Irish Book Awards. She has also been shortlisted for the Hennessy New Irish Writing Awards, America’s Pushcart Prize and Ireland’s Francis MacManus Short Story Award. She received a bursary from the Arts Council of Ireland to work on FERENJI and she is currently working on a novel. For full press release, please click this link. In Ferenji, we glimpse the lives of those who work in the field in humanitarian aid, peacekeeping, human rights/refugee issues, or journalism. Some stories are set in an African country where a United World peacekeeping mission maintains a fragile calm following a brutal civil war. Others take place in a live conflict environment where international staff are largely restricted to a Green Zone and where abduction and bombings are daily threats. Stories explore landscapes both personal and geographical as well as the challenges and inspirations encountered – with a little field humour scattered throughout. The book’s tongue-in-cheek title has its historic origins in Persian or Arabic and is still much used from Ethiopia to South East Asia. It basically means “bloody foreigners” and the nuance runs from affectionate to pejorative. Anyone who has worked in the field knows the blessing and dilemma of what it is to be a ferenji. Publicity for the book’s release is handled by Cormac Kinsella and has included a glowing IRISH TIMES review, a HOT PRESS interview, an ARENA interview, a HOT PRESS book review and a SUNDAY TIMES feature. ‘Reprisal’, one of the book’s short stories, has been published on the IRISH TIMES.com website. In the “Best Books of 2016” feature, author Nuala O’Connor (“Miss Emily”) cited Ferenji as one of her favourite books. In THE IRISH INDEPENDENT “Writers Favourite Books of 2016” feature, Dermot Bolger also named “Ferenji” as one of his favourites. Sue Leonard in the IRISH EXAMINER has described the book as “a quite wonderful collection.” Author Orla MacAlinden also named it one of her faves in 2017, and you can see the most recent review of the book here. Helena received a bursary from The Arts Council of Ireland to develop the work and for news check back to Helena’s BLOG. See the Ferenji BOOK TRAILER here. Download the Press Kit here. Buy Ferenji here. “Very moving stories … ” – Seán Rocks, ARENA.